The practice of management is rife with the motivational quote trope. From corporate cubicles to athletic practice fields, team leaders everywhere rehearse regurgitated sayings straight out of Successories posters. They hope that a particular piece of prose will resonate with their team members and inspire exceptional performance. It isn't the most saccharine statement you'll run across when Googling "motivational quotes for teams". But it's just abstract enough that one can shape its fuzziness to fit their particular narrative. It is hard to argue with the quote's originator, though; he certainly understands plenty about the power of a team's individual contributors. Jackson, known almost as much for his deft management of extremely talented players with challenging personalities as for winning a record 11 NBA championships, famously curated recommended reading for each of his players, based on his knowledge of each individual. Leaders like Jackson know that, to get the most from their teams, they must understand what makes their individual contributors uniquely powerful. They must position those team members in roles that allow them to develop and succeed individually. And they must place them among teammates with whom they can partner to accomplish performance goals that matter. It isn't enough to say things like the strength of the team is each member, or that the strength of each member is the team. Great managers must take a strengths-based approach to knowing and developing their teams and the individuals who compose them. That's how winning workplace cultures that deliver exceptional performance on the metrics that matter take shape. Your managers are probably judged less by how many championship trophies they collect than by whether they achieve their performance goals and lead their teams to great outcomes. It is important to note, then, that a strengths-based approach is proven to have a positive impact on the key outcomes that matter most to managers and the teams they lead. For example, Gallup researchers conducted a meta-analysis study of 49,495 business units comprised of 1.2 million employees across 22 organizations in 45 countries. The research examined six outcomes: sales, profit, customer engagement, turnover, employee engagement and safety. The study found that, on average, workgroups that received a strengths-based intervention improved significantly on these key performance measures compared with groups that received little to no strengths-based development. When you pair the positivity that is elemental in discovering what someone naturally does best with a vocabulary that is easy to understand, the result is a way for teams to talk about themselves that's empowering and enlightening. Improving team engagement or reducing turnover isn't exactly the same as winning 11 championship rings, but these are representative of the kinds of performance outcomes almost all teams and their leaders constantly strive to achieve. Certainly, those business outcomes provide evidence as to why managers should lead teams using the knowledge of what their team -- as individuals and a collective group -- is naturally good at. But, these outcomes don't explain why a strengths-based approach to team leadership works. Strengths-based teams communicate using a common language grounded in what's good. 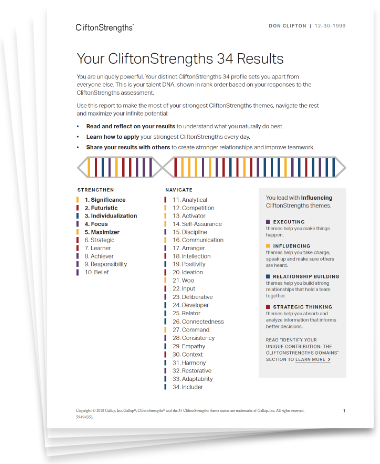 The CliftonStrengths assessment measures an individual's unique rank order of 34 themes of talent. These themes in totality represent a person's most powerful natural traits or abilities. This common language of CliftonStrengths gives people a sort of shortcut for getting to know one another and create trust among each other. It fosters productive, ongoing conversations about what talents people bring to certain situations. And it's a language that bridges cultural and organizational demographics, giving individual team members ways to communicate why they're unique and how that uniqueness can benefit the team. "It is the first thing you see when you see this person -- their name and their CliftonStrengths. Right away, you start to have a sense for who they are." "I like it. I know [my teammates] and they know me. It helps me to know how they might want to communicate or what is important to them. People working with me can know this about me, too. They can get a sense of what I bring to the table and how we can work together." Strengths-based teams know how to deliver on what's expected of them, individually and as a group. What are my talents and strengths? What are the expectations of my role? How will my manager coach my development? What unique contribution do I make to the team? How do we best work together, using our strengths? The answers come only when managers empower their teams to discover their CliftonStrengths and engage individuals in conversations focused on helping them use their CliftonStrengths to achieve exceptional performance in their roles and responsibilities. There's no faking this type of coaching: it takes commitment from the manager and their team members to intentionally keep a strengths-based approach at the forefront of their everyday efforts to succeed. Strengths-based teams understand and value each person's unique contribution. Forget all of the greater-than-the-sum-of-its-parts motivational sayings and focus instead on why it is imperative to know and support each individual's contributions to the team. Every individual brings something unique and powerful to the team. And every individual has areas where they're just not strong. That's understood. It's up to the manager to work with the individual to help them know how they naturally excel, where they need help from their teammates, and what shared goals or purpose they're all using a strengths-based approach to achieve. Specifically, managers can use a strengths-based approach to intentionally promote effective delegation, successful partnerships and deeper collaboration, among other outcomes. For example, think of a manager looking to find a mentor for a new hire. Will that new hire have a better experience with someone who has been there the longest and is productive, or with someone who has the experience and the natural ability to answer the same questions multiple times or to tailor their teaching style to fit the new hire? A strengths-based approach in this case can be the difference between an average mentor experience and a great one. A clear understanding of someone's unique contributions to the group can spark better collaboration and ultimately result in greater performance at the individual and team level. Strengths-based teams have meaningful conversations with their manager. At the heart of every high-performing, strengths-based team is a manager who acts more like a coach than a boss. 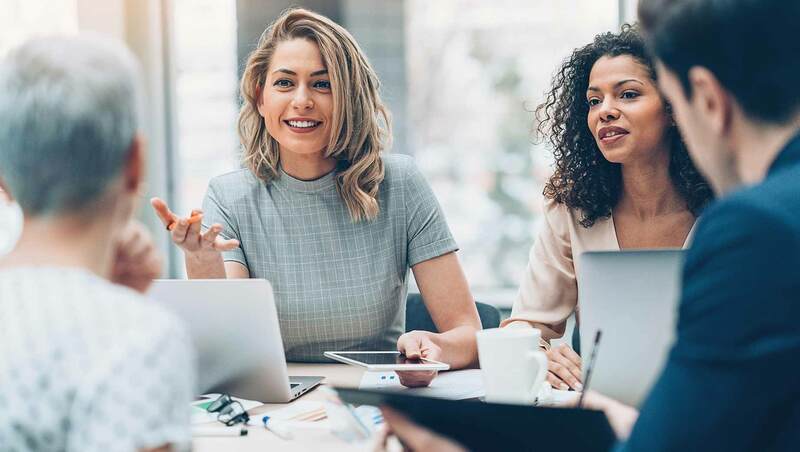 Setting goals, clarifying expectations, crafting effective performance development plans -- these critical steps can't happen unless managers take the time to have purposeful, powerful conversations with employees, individually and as a team. It is in the midst of these conversations that CliftonStrengths proves a key differentiator. 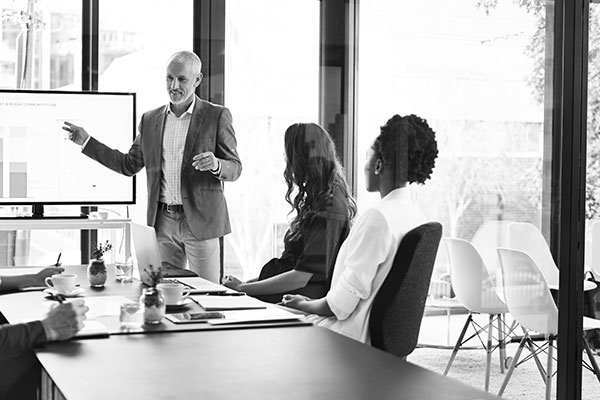 Managers can use a strengths-based approach to further individualize these key touchpoints, thereby ensuring greater odds that the conversations will be fruitful for both the individual and the team as a whole. For example, a manager of an employee who leads with Relator or Woo or Positivity or Harmony may want to start conversations connecting with the person before launching into an agenda. Communicating first about personal matters may help them then connect later about the task at hand. If that employee leads instead with Responsibility, Focus, Discipline, or Deliberative, the manager may want to provide the employee with an overview of the agenda ahead of time, so they can prepare. 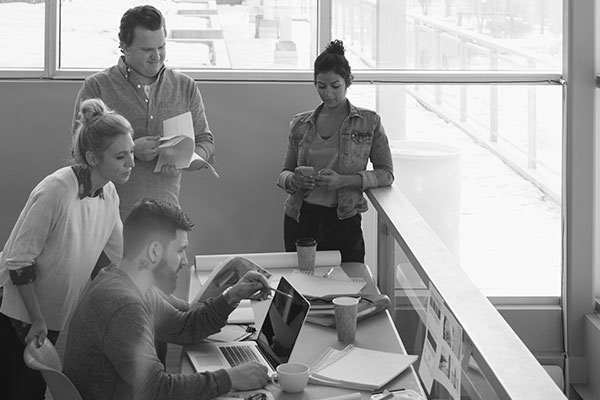 If done correctly, these conversations can lead to the kind of development and growth that inspires employees to go above and beyond for their team and their organization. Plus, communicating with a focus on CliftonStrengths can help teams and entire organizations identify opportunities for improvement. For example, take an executive leadership team whose collective CliftonStrengths fall primarily into the Relationship Building and Executing domains. By understanding and communicating about this current state, they can plan for the future and bring leaders with Influencing and Strategic Thinking talents onto the team, in order to create a more well-rounded team. Using CliftonStrengths allows teams to move beyond an understanding of common "types" of people on a team. It allows for more specific insight into the natural talent of the individuals on the team and the collective strengths of the team. This specificity provides the foundation for more focused and effective actions to ensure the team as a whole is getting stronger. You won't see it immortalized on a motivational poster, per se, but that type of strengths-based approach to leading teams is essential for creating a winning workplace culture. Understand how managers use CliftonStrengths to maximize their team's potential. 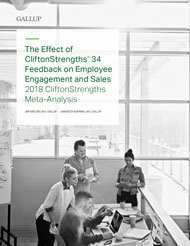 Review our research on the business outcomes of using CliftonStrengths with teams. Discover how to lead high-performance teams using a strengths-based approach. Request a demo of Gallup Access, our platform for bringing the power of CliftonStrengths to teams and organizations. Cathy DeWeese is a Senior Workplace Consultant at Gallup. Learn how a strengths-based approach can be a powerful differentiator at every stage of your organization's employee life cycle.